Comune di Francavilla d'Ete (I). Facoltà di Beni Culturali (I). The project OPEN STREET, supported by the European Commission, aims at the analysis and development of common policies for the promotion and growth of street arts throughout the European Union. In the first year of activity we have achieved important goals such as adherence to the open web platform of over 450 street arts members (companies, institutions and festivals) from 28 different countries. This gives us good hope in the possibility of establishing in short time the European association for the promotion of street arts, which is truly representative of all respective national entities: a specific meeting on this important line of action will be held in Bremen in August 2011. Through the action plan 2011 and 2012 we also intend to start a pondering on the relationship between the show and the organization of urban cultural life of European cities , that enhance the urban show. Aiming to this objective, the meeting of June 25 next to Montegranaro (Italy) will be a very important, hopefully interesting as well, moment of pondering for all of us. In adhesion to the spirit characterizing our open model of cooperation, we ask our guests to participate to the creation of meeting contents. On last page of programme we propose some key points that we believe should characterize the positive relationship between city and urban show, occurring in cities that can be considered OPEN to street art. C) Promotion of integration between cultural heritage and urban show. C) Supporting the growth of this art sector: promotion of creation, of training, to favour the art residences, to organize occasions of pondering and meeting between art operators and institutions. F) To promote street arts outside the ambit of street arts: in the context of other cultural programs of the city, to increase the number of events that are dependent on, or refer to, the ambit of street art, to which they link the values, or to which they relate their shapes. >> FNAS – Federazione Nazionale Arte di Strada, Tel e Fax 0438 580986; info[at]fnas.org; Cell +39 338 7138903. >> Uff. 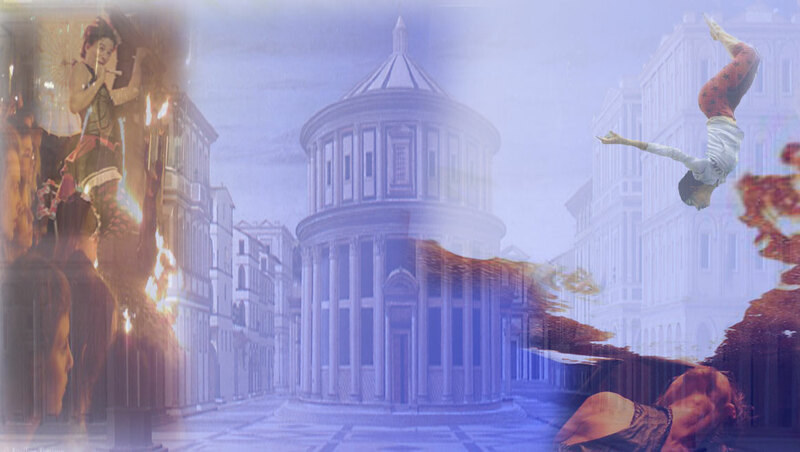 Turismo e Spettacolo Comune di Montegranaro, Piazza Mazzini 1, 63014 Montegranaro (FM); Tel 0734 897932; Fax 0734 889991; Cell +39 335 7591515. 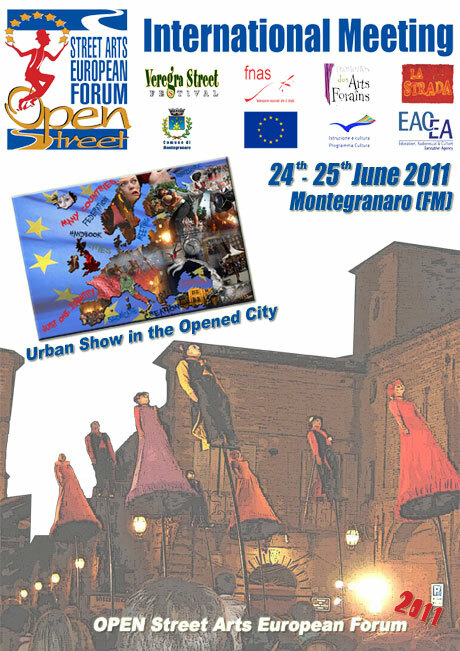 The International Meeting OPEN Street 2010 will be held Sunday 20th June 20 in Pennabilli (Rimini) at closing of the XIV Festival ARTISTI IN PIAZZA and Monday June 21st in Montegranaro (Fermo) in occasion of opening of the XII edition of VEREGRA STREET FESTIVAL. 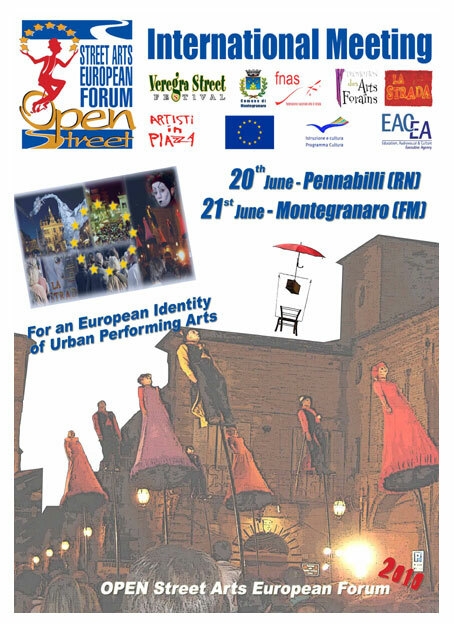 The appointment will start the project of international cooperation OPEN STREET - Street Arts European Forum coordinated by the municipal administration of Montegranaro and supported by the European Commission for the biennium 2010 – 2012 in the ambitr the Culture Programme. The appointment will represent the start of international cooperation project OPEN STREET - Street Arts European Forum coordinated by the City of Montegranaro and supported by the European Commission for the biennium 2010 - 2012 in the ambit of the Culture Programme. “Artisti in piazza” and "Veregra Street" are two of the most interesting events devoted to street performing art in Italy. The cooperation between these two projects, the commitment of the Italian National Federation of Street Art, the involvement of European institutions such as the Festival "Namur en Mai", Namur (BE) and the Festival "La Strada" in Bremen (D) have laid the groundwork for the project OPEN Street, which is joined by sector entities and institutions of different European countries. The beautiful hills overlooking the Adriatic between Emilia and Marche will host a double event in which the potential of a strategic sector for the construction of European cultural identity will be underlined. A brand new and meantime ancient and deeply rooted discipline of our continent, which needs today greater recognition by the institutions.